Buenos Aires Guest House is a family run B & B with hosts Andy and Rachel Keevil. * 1 Minute walk to the De La Warr Pavilion, sea front and the town centre. Situated in a quiet side street. * 6 Minute walk from Bexhill railway station. * Quality and spacious en suite and non en suite accommodation. * Free Wi-Fi connectivity throughout. * Freshly cooked English breakfast. Vegetarians catered for. * Highly Rated - winner of several awards. * Check Availability & Book Online. Our rooms are all finished to a high standard, are spacious and have all the amenities you will need. Buenos Aires is in a great location near the beach in Bexhill and within easy reach of some wonderful Sussex towns. Our rates are great value for high standard B&B accomodation in a terrific location. Bexhill On Sea is a stuning seasside location with a huge amount of activities and picturesque towns nearby. We have a full snack menu always available with a variety of food to suit all tastes. Our previous guests love our guest house. We have many 'excellent' reviews on TripAdvisor. Twin or double room with shared facilities. Standard double room with shared facilities. King size double room with en-suite bathroom. Four poster king size bedroom with deluxe en-suite bathroom. 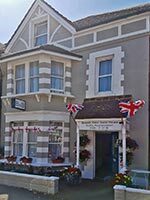 If you have questions or queries about our Bed & Breakfast accommodation in Bexhill on Sea then we would love to hear from you. We can be contacted by phone, email or even via the post. In the mean time please feel free to browse through our website, we hope the pages will answer most of your queries and help you get the best out of your stay in beautiful Bexhill on Sea.